In the complete version, the manifolds are equipped with ﬂow rate regulation valves (ﬂow meters), with preset cut-off valves set-up for electro-thermal actuator-control and with drain and air vent units. As an alternative to ﬂow meters, it is possible to request the installation of regulation lock shields. 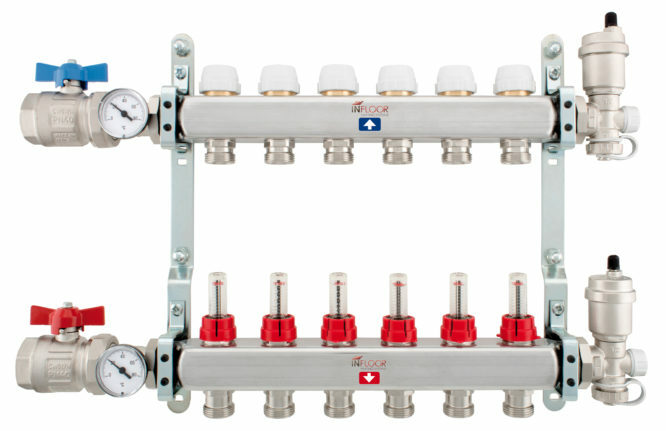 The high-quality, extremely efficient, and easy-to-install manifolds offer unparalleled design freedom and easy installation.